The refuge islands, measuring up to 72 feet in length, are designed to close the distance for pedestrians trying to cross the four-lane avenue. JEFFERSON PARK — A two-mile transformation of Milwaukee Avenue has gone from blueprints to concrete, as city planners fulfill a years-old goal to dot the Gladstone Park corridor with clear and safe pedestrian crossings. Crews last week built the skeletons of nine pedestrian refuge islands, each measuring between 50 and 72 feet long, between Foster and Devon avenues. They'll soon to be accompanied by more than a dozen sidewalk bump-outs, slashing the crossing distance for pedestrians all along the corridor. 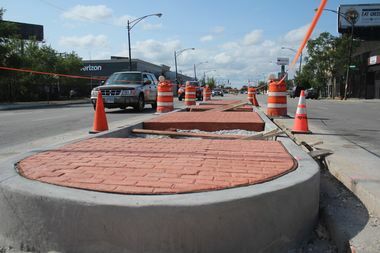 Some of the islands will sport trees and grasses, mimicking the crosswalks lining Lawrence Avenue in Lincoln Square. A tenth, shorter island will bisect the avenue just outside the Jefferson Park Transit Center, officials said. 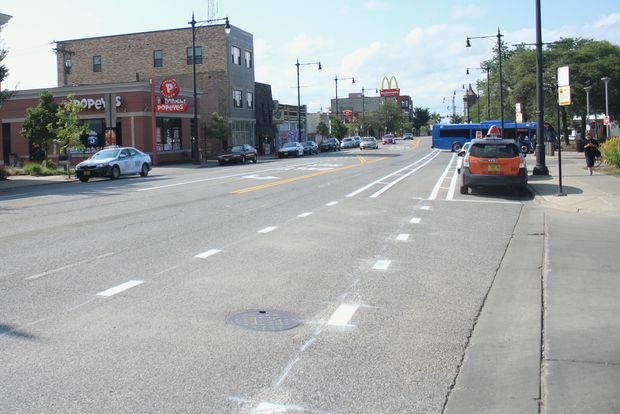 The new crossing between the bus terminal and the soon-to-open Weston's Coffee & Tap Co. will be the final stroke in a total makeover of lane markings in the 4900 block of North Milwaukee Avenue. The islands "make it safer for people crossing the street" by allowing them to cross one direction of traffic at a time, according to Michael Claffey, a spokesman for the city's transportation department. City workers on Wednesday also drew separated bicycle lanes along the block, book-ended by existing shared lanes in both directions. A new left-turn lane for buses will funnel northbound car traffic into to a single lane, marking the only loss of space for drivers wrought by the streetscape project. But officials don't expect the change to have much impact on traffic, according to Owen Brugh, Ald. John Arena's chief of staff. "Once you get north of the viaduct, it turns into a four-lane road, so you don't tend to see much backup for cars moving in that direction," Brugh said. "So we don't think making it one lane right in front of the transit center right there will create much congestion." Plus, Claffey said a new left-turn lane in each direction at Higgins Road will help traffic flow more smoothely by "providing dedicated space for turning traffic outside of the thru motor vehicle lane." The entire project is scheduled to wrap up by the end of September, officials said. An earlier vision for the street overhaul had called for a "road diet" shaving one lane of traffic from MIlwaukee in each direction to make room for buffered bike lanes, but the plan was scaled back in the face of resistance from neighbors.